Discussion in 'Star Style' started by LetThemEatCake, Dec 25, 2009. Martha Stewart is an American business magnate, television host, author and magazine publisher. As founder of Martha Stewart Living Omnimedia, she has gained success through a variety of business ventures, encompassing publishing, broadcasting, and merchandising. Stewart's syndicated talk show, Martha, is broadcast throughout the world, she has written numerous bestselling books, and she is the publisher of Martha Stewart Living magazine. In 2001, Stewart was named the third most powerful woman in America by Ladies Home Journal. I adore Martha. We've chatted about luxury skincare on her Sirius radio show, her words being, "Cleanliness is of utter importance." She is a true inspiration to me. She's not a style icon, at least in my opinion, although she does have impeccable and rich taste. Her art and her persona and appearance are all about being coordinated, collected, 'proper' and I love the aesthetic of that. She's a horse lover, owning five beautiful Friesian draft horses. Some more info about her, I love this interview from Nightline recently. I adore her, I like her more then Oprah as far as tv personalities go. She is far more fabulous and multi-talented than Oprah. She was also a billionaire first. Martha Stewart Show is my favourite programme in the morning during my holiday break I enjoy her cooking and craft segments a lot! Most of the time I pick up some inspiration and noteworthy tips for diy projects. She's generally an animal lover, she has quite a few cats and dogs too which she sometimes bring on her show, especially Francesca! I love her French bulldogs, Francesca and Sharkey, too. I think Martha is all kinds of fabulous! Thanks for posting the Nightline piece! ^^You're welcome. I remember you're from Westchester! Do you know the area she lives in, Katonah NY? I would love to see her property in person, mainly that gorgeous stable that houses her horses and mules. HER in Star Style? but she hasn't any! LTEC, yes. She lives on the same street as the Harvey School, if you are familiar with the area. You can see her home right from the street. I live about half an hour away down in Scarsdale but I've been up there many times as one of my best friends went to the Harvey School. I admire her style because I think it is American classic - fitting Ralph Lauren is a neighbor. I love her confidence...she has an air about her. I enjoy her and her lifestyle. I know it isn't for everyone. 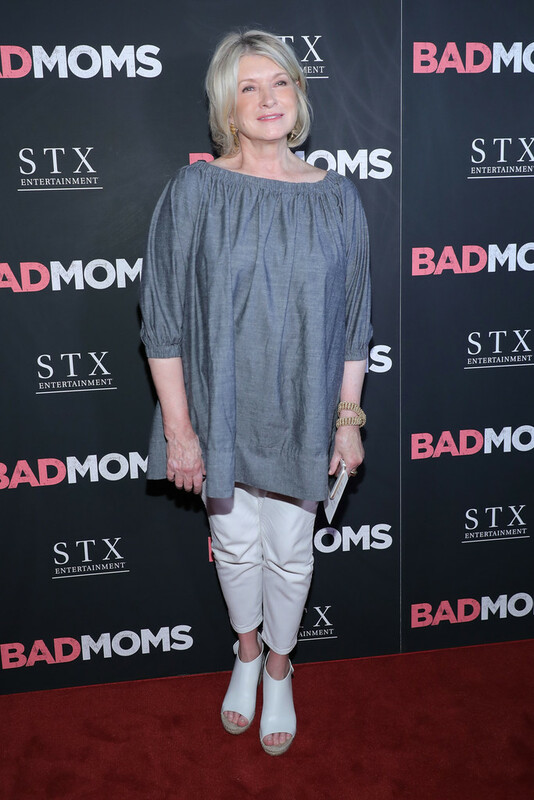 Martha Stewart attends the "Bad Moms" premiere at Metrograph on July 18, 2016 in New York City.